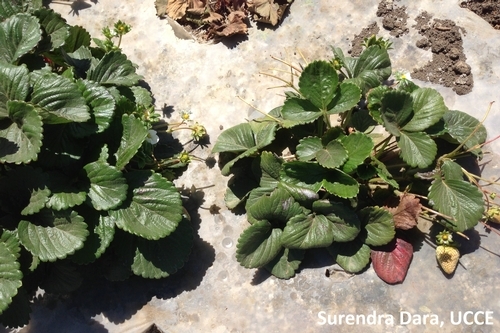 Many strawberry growers in the Santa Maria and possibly in Salinas and Watsonville areas are now aware of a disease that is causing the die out in some fields. History of heavy whitefly infestations, symptoms of infection, and diagnosis of one of the key viruses (Strawberry pallidosis associated virus or SPaV) suggested that the disease could be pallidosis-related decline. However, other partner viruses that are necessary to cause this disease have not been confirmed until now. USDA-ARS plant pathologist, William Wintermantel in Salinas previously diagnosed SPaV in some infected strawberry samples. 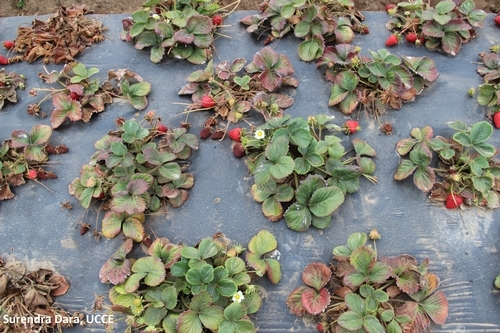 Robert Martin, ARS plant pathologist in Corvallis, conducted additional tests and confirmed the presence of Strawberry necrotic shock Ilarvirus (SNSV) and Strawberry mild yellow edge Luteovirus (SMYEV). SNSV and SMYEV are among non-whitefly transmitted viruses that are required, in addition to the whitefly-transmitted SPaV or Beet pseudo yellows virus (BPYV), to cause this disease. SNSV is transmitted by pollen and SMYEV is transmitted by aphids. 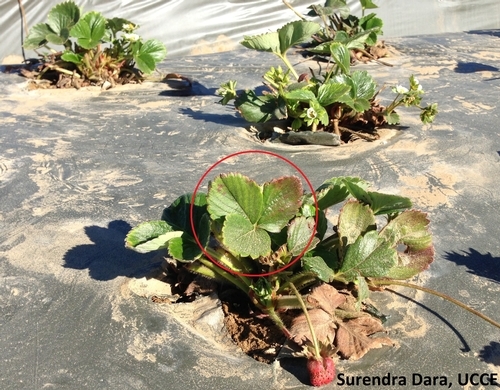 Aphids are generally not a problem in strawberries. Multiple species of aphids that include green peach aphid (Myzus persicae), melon aphid (Aphis gossypii), potato aphid (Macrosiphum euphorbiae), and strawberry aphid (Chaetosiphon fragaefolii) are seen in late winter or early spring. But whiteflies (mainly greenhouse whiteflies) have become a common and serious pest in some areas especially where fields are carried over for the second year production. Continued availability of habitat with unlimited food supply promotes whitefly infestations. Some fields in the Guadalupe area had severe whitefly infestations as early as November, 2012 and continued for several months. The impact of whiteflies, until this year, is limited to the feeding damage and sooty mold developed on honeydew secretions. With the transmission of virus(es) that contribute to the pallidosis-related decline, whiteflies are becoming an important pest. Symptoms of pallidosis-related decline include stunted plant growth, brittle roots, purple foliage and eventual death of the plant. Once they are inside the plant, viruses remain systemic in the plant tissue. Plants may recover from symptoms if the partner virus is SNSV, but plants will not recover when infected with SMYEV (Martin, personal communication). New growth may look normal when the virus titers start declining in the summer, but when the titers increase later in the fall, the new growth will also show infection symptoms (Wintermantel, personal communication). Diagnosis is very important whenever there is there is a problem. Samples can be sent to local UCCE or Ag Commissioner's office for proper diagnosis. 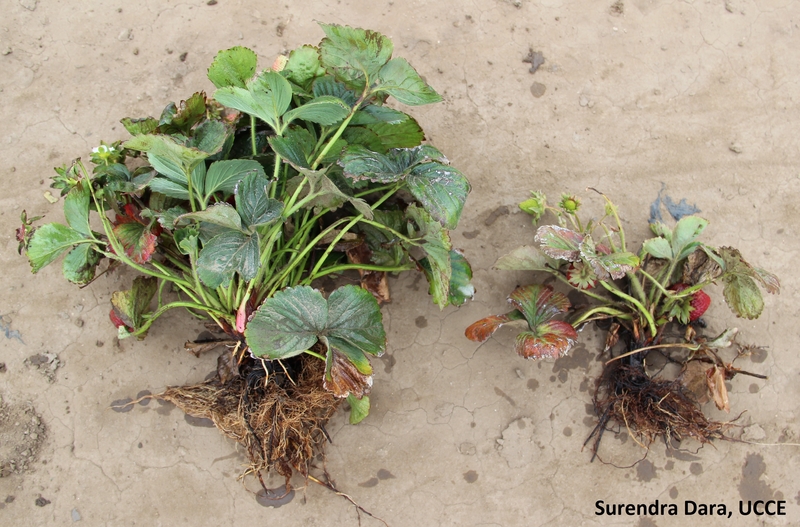 Some of the infected samples from the Santa Maria area also had Phytophthora sp. or Cylindrocorpon sp. in preliminary testing. So, identifying the causal agent is necessary to make appropriate treatment decisions. 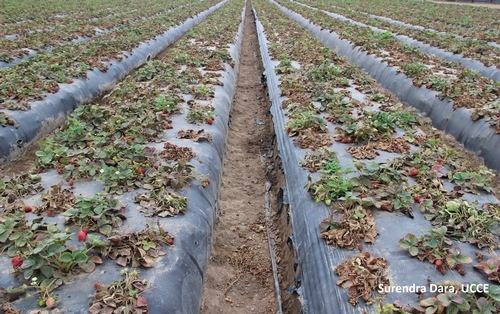 It will help contain the problem and avoid unnecessary pesticide treatments and other related complications. Growers and PCAs in Santa Barbara County can submit their samples through local Ag Commissioner's office units to the plant pathologist, Heather Scheck. Submit the whole plant at least with some new growth and symptoms of infection. Testing is free, but can take a few days to weeks which is typical for identifying plant pathogens. Since there is no treatment for the pallidosis-related decline (fungicides and fumigation do not work) and there is not much that can be done about the pollen-transmitted viruses, vector management is the key to address this issue. Managing aphids and whiteflies remains to be the only option for us now. Adopting good agricultural practices, communication and collaboration among growers and PCAs can help limit the spread of the vector and the pathogens. 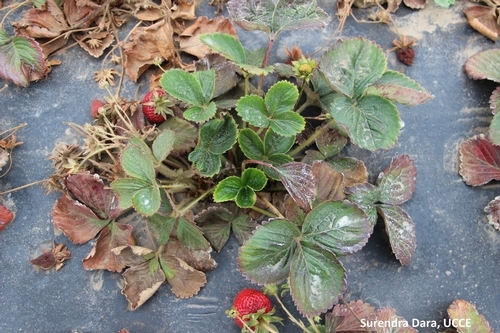 Using clean transplants, regular monitoring, timely application of effective and safe pesticides, rotating chemical pesticides with different modes of action, alternating with botanical or biopesticides, conserving natural enemies, timely control of pest infestations in fields upwind, timely diagnosis of the pest or disease are among the available options.